The death toll from a powerful earthquake that rattled several parts of Nepal, including Kathmandu Valley, on Saturday has reached 686, according to Ministry of Home Affairs (MoHA). More than 500 people are reported to have been injured and are receiving treatment on the streets as most hospitals have been inundated with casualties. 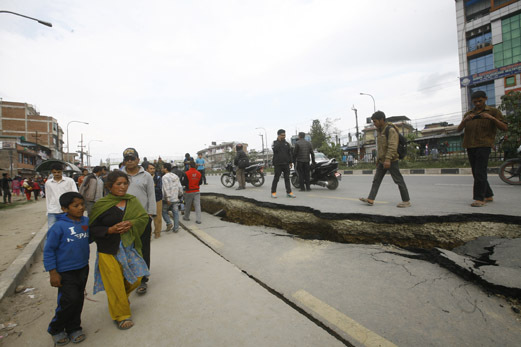 The earthquake that affected 38 districts has badly hit Kathmandu, Lalitpur, Bhaktapur, Gorkha, Sindhupalchok and Lamjung. According to the MoHA, 54 deaths in Kavre, nine in Makwanpur, 10 in Okhaldhunga, five in Ramechhap, two in Bhojpur, six in Nuwakot and 12 in Gorkha have been reported so far. The earthquake has also killed 10 mountaineers at the Everest base camp. They were preparing to summit the Everest this season. The death toll could go higher as hundreds more presumed to be under the debris of the collapsed houses. 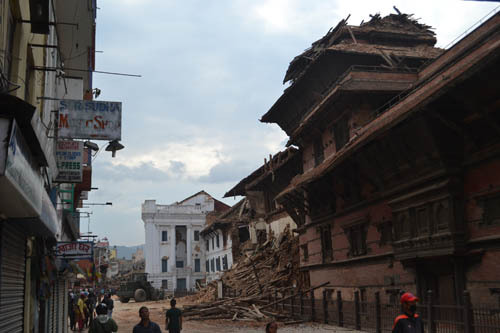 The earthquake, measured 7.9 in the Richter scale with its epicenter in Lamjung district, leveled many historic and archeologically important sites in Kathmandu Valley, including Dharahara and nine-storey palace in Basantapur durbar square. The earthquake damaged hundreds of houses in Kathmandu Valley, rendering a large number of families homeless. Hospitals are now teeming with injured people and dead bodies. As aftershocks of the earthquake continue to rattle Kathmandu Valley, thousands of people are now on the streets. Thousands more are staying in open areas like Dasarath Stadium, Tundikhel and Khulamanch. As of 3 p.m., 86 dead bodies had been taken to Bir Hospital and 60 in Tribhuvan University Teaching Hospital (TUTH). 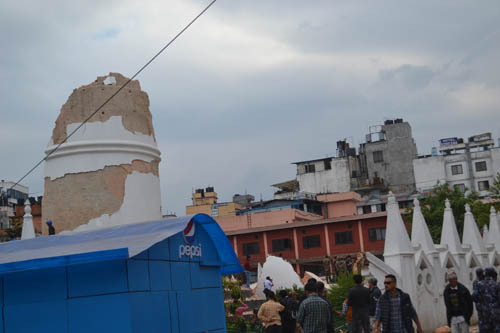 Dharahara collapsed leaving more than 100 people dead. May their soul rest in peace. Government of the world need to gear up on climate change; it is real, because we have started and will be seeing unprecedented event due to (climate change) effects…. Thinking of Nepal and our good friends there. I hope the Australian government sends aid as quickly as possible to help. Introducing myself — Julie McCarthy, Delhi Bureau Chief, National Public Radio, like BBC but in US. I’m coming early tomorrow to Kathmandu and need a fixer to work with who has great English — (this is broadcasting.) Can you help? Do you know of anyone — apart from your good self who would be outstanding, of course. It’s such a human drama that I won’t be able to do much with a translator channeling the emotions and the devastation. Nabbesalko bhukampama,duing the 1935 Earthquake Shri 3 Maharaja Juddha SS JB Rana was the Prime Minister & the Supreme Commander-in -Chief of the then Kingdom of Nepal. He was offered aid from friendly countries then. But he declined the aids for reasons of his own. He was a proud person no doubt. Now the first S O S is the call for foreign aids. Aids has debilitated us or what? What is the damage at Sidhupalchok. 6 of my Indian friends are there. I have no contact with them. Can anyone help. Their names are as follows. They were staying at “The last Rsort”. This is really shocking. The death toll in Nepal from Saturday’s catastrophic earthquake has jumped to at least 2,263. I ‘m heart broken for you dear people.Kathmandu is a sacred city.Some have Jerusalem;I have you.I first found you in ’92,when visting my friend Lama Dawa Chodack at Losar in Boudha.My heart is buried beneath your streets. The only place,in my whole life,where I felt at home.A beautiful and tractable people.My friend Barry Tucker,here in California was relating his friends plight as well as all of your’s. I shall surely help you,my dearest soul! we are lucky to be alive. unfortunately, tibetans are a smaller group in this country，we are still in the shadow of the disaster,nobody pays attention to us, we just need help to rescure our life. I hope every one sends aid as quickly as possible.